Margaret Earnshaw wires Martha Berry to tell her of her upcoming visit to Rome. 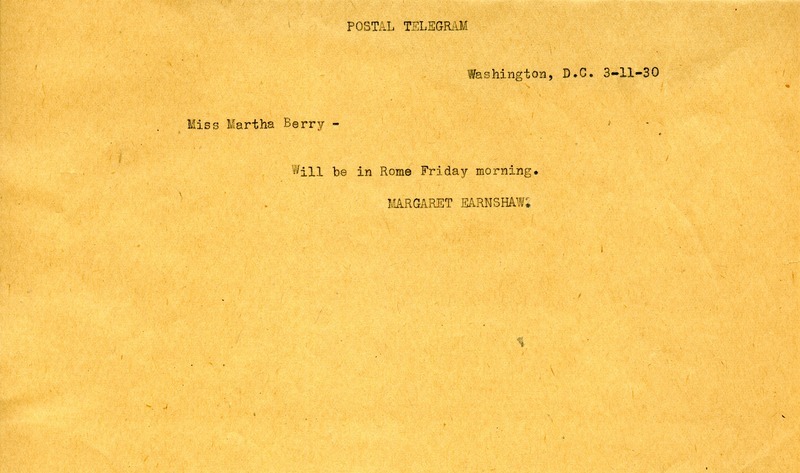 Margaret Earnshaw, “Letter to Martha Berry from Margaret Earnshaw.” Martha Berry Digital Archive. Eds. Schlitz, Stephanie A., Meg Ratliff, Chelsea Risley, Emilee Sargent, et al. Mount Berry: Berry College, 2013. accessed April 26, 2019, https://mbda.berry.edu/items/show/12420.